On a hot afternoon in southern India, the atmosphere inside the small community centre was unbearably sultry. But for a group of women, the heat was not terribly bothersome, as they were in the middle of an informative and eye-opening session on child care and parenting skills. Led by Beula Ruth of the Kalaiselvi Karunalaya Social Welfare Society, one of ChildFund’s local partner organisations in the state of Tamil Nadu, the workshop was aimed at educating pregnant and lactating mothers about prenatal and postnatal care. Saraswathi and her baby at a parenting workshop in southern India. There has been substantial improvement to government health services in India, but a majority of people living in rural areas still don’t have access to health care. And that’s where ChildFund comes into the picture, by working with the government and local partners to bring public health services to underserved communities. A doctor sees patients during a health camp organized by Pride India in the district of Raigad. As part of our Early Childhood Development (ECD) program, ChildFund and its partners in India conduct training sessions for mothers, discussing good nutrition (both for themselves during pregnancy and for their children under the age of 5), developmental benchmarks and preventive health care, among other issues. Last year, there were more than 9,000 training sessions across India, with more than 180,000 parents and other caregivers participating. As a result, more than 86 percent of births occurred in hospitals or other health institutions, and more than 68,000 children have been fully immunized. Like Beula, Anita Ghalekar in Chochinde Kond — a remote village in Maharashtra State’s Raigad district — is a busy woman. Even after her retirement from ChildFund’s local partner Pride India, she is committed to maintaining access to health services for local families. Besides overseeing ChildFund’s home-based ECD intervention activities in her region, Anita leads 15 health camps, which provide workshops and care in individual villages. 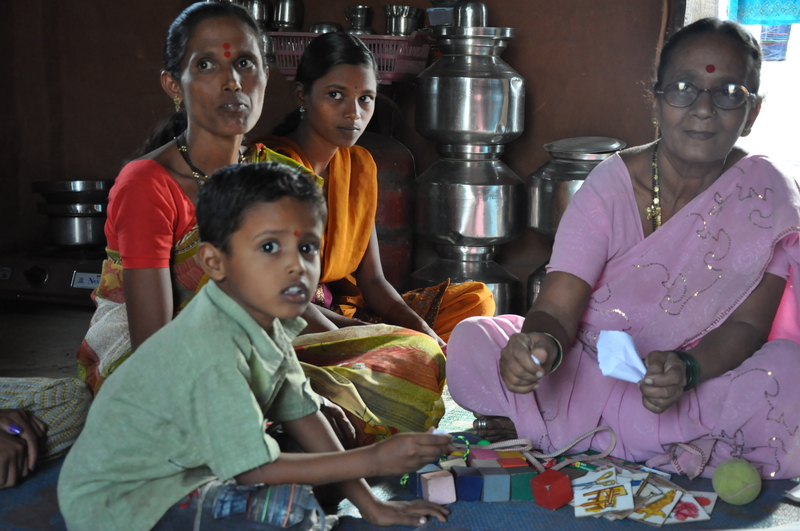 Anita Ghalekar monitors a boy’s growth in his home in the Raigad district.